All nine – but none falls down! Often copied, never quite achieved. 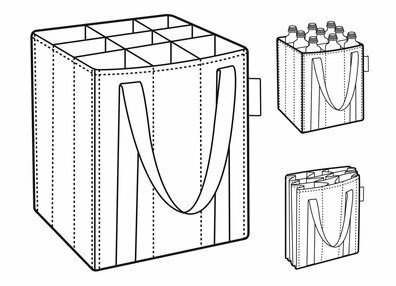 Bottlebag is the original version, allowing nine bottles to be compactly, safely and comfortably carried. Bottlebag is the perfect bag to carry bottles without breaking them or hearing the annoying rattle. More than once, BottleBag has proven it can be as useful for shopping as it is for recycling bottles.